Paper drinks bottles -- best of both worlds? The hot weather for the 2018 London Marathon recently opened up the age-old debate between supplying water for running races in plastic bottles, versus paper cups. Particularly with the recent focus on plastic pollution wonderfully raised by David Attenborough. But could there be a third way -- the paper bottle? Here's a sketch, with more thinking below. Someone, please make these! I run a marathon at about 10 mph/16 kph. Ever tried grabbing an open cup at that speed without spilling any? Known techniques are pinching the top or covering it with your other hand, but it's usually pretty disastrous. I can end up with almost nothing. If I slow by 5 sec at each of 25 drinks stations in a hot marathon, that's over two minutes lost -- enough to turn a PB into a poor outing. So pausing is not an option. Bottles just hold more. Getting a reliable 330 or 500ml from a bottle is way better than getting 150 ml (if you're lucky) from a cup. You can run with a bottle for a while, sipping some water, and then squirt the rest over your hair and vest for cooling if it's hot. With a cup you get one big gulp or two, which can go down the wrong way, and generally have to choose that or using it to wet your hair a little. And you don't get enough to really drench yourself. But bottles can be dangerous. I'm lucky enough to be nearer the front of race fields, with clear roads. But if bottles accumulate, there is a distinct danger of rolling an ankle and crashing out with an injury if you step on one. A big race like London has an industrial clear-up team, so the sea of discarded bottles will nearly all be recycled. But a few will get lost awkwardly under a hedge or in a drain, causing some litter. And in small races, some (bad) runners will toss bottles and other litter where they just won't be collected. Compostable paper cups squash flat, posing much less hazard for following runners, and those that aren't collected will at least degrade benignly after a while. The energy cost of manufacturing and transporting plastic bottles of water from afar is obviously a lot greater than filling empty cups locally from a camping container or hosepipe. It is easy to run out of bottled water, or end up with a huge excess. Using cups, you can stop filling them when you start running out of athletes, and keep the unused ones for next time. The bottle has to start in a folded flat shape so you can pack lots into a box for distribution. Imagine a squashed juice container. Something like that. It has to open out into a rough botle shape when filled, and even if it's a bit squidgy, support itself upright on a table. That way one volunteer can be filling them while another is handing them out to runners. 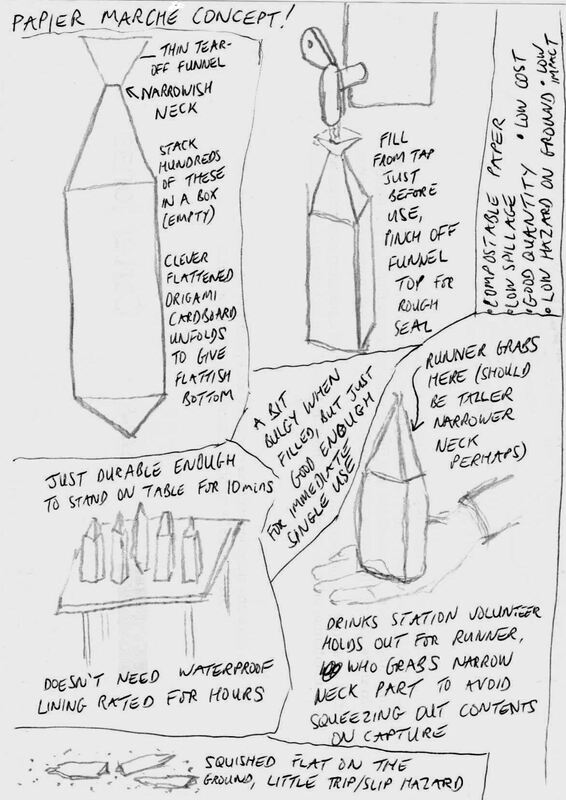 For filling, you could use a pointy nozzle on your water source, but otherwise let's include a thin paper funnel shape as part of the bottle to make it easy. Once filled, that funnel can be twisted off and discarded (or twisted up and left for the runner to tear off, to make a rough seal). The neck should be fairly long, so the runner can grab the top part without squeezing too much water out as they capture it. It only has to hold water for a few minutes while it sits on a table. So no need for durable but polluting plastic liners or anything like that. You can have a big excess of the things at a drinks station and take home the ones you don't need for next time, just like cups. They should take few resources to make and are compact and light to transport, as the actual water is added locally at the last minute. I wanted to call this concept the "papier marché" as a pun on papier-mâché, but Google Translate tells me that means "paper market". But "papier marche" is paper works or maybe paper walks. Just the (paper) ticket!